Post and bottom photo by the Hawthorne Hawkman, top photo from the Hennepin History Museum, used with permission. 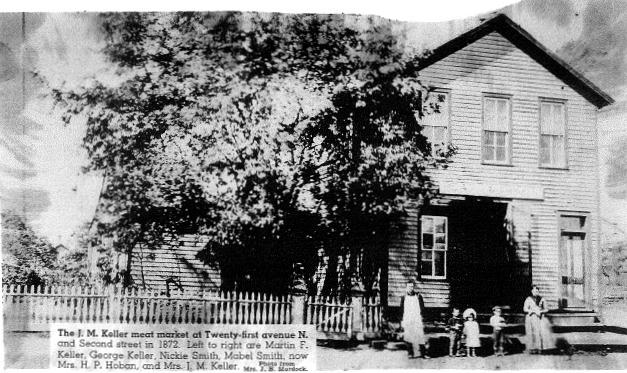 Today at FLOW I will lead a historic walking tour at key nodes along West Broadway. Although to be more accurate, this walking tour is meant more to showcase the Historypin website and smartphone application. I consider it quite likely that others joining me for the event will know more than I do about connections to our community's past. And that's quite the point of the exercise; my goal is to raise awareness about both the application and our history, so that our neighborhoods can strengthen those connections. 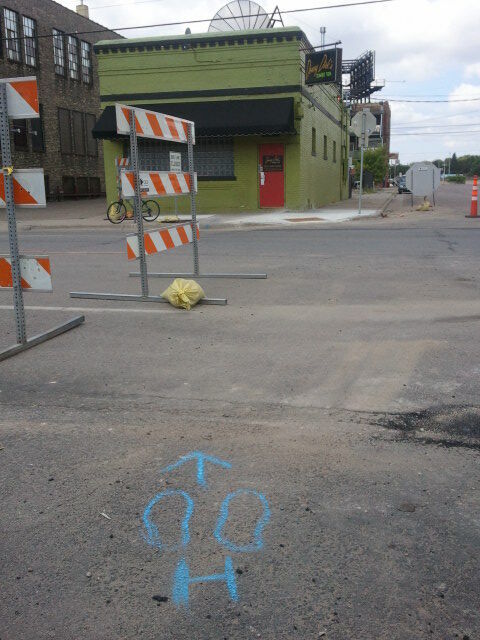 Between two and three today, I will be at the Broadway and North 2nd Street node. From four o'clock to five, I will be at the Capri Theater, showing photos along that stretch. And from five thirty until seven, I will be around Broadway and Emerson. That node has the most photographs pinned, and should prove to be the most revealing segment. Ironically, that same stretch shows the main flaw in the Historypin application: what were once many separate addresses for individual storefronts have now been consolidated into one or two large commercial buildings that take up entire blocks. Since the app "pins" photos using Google Street View, the pictures are attached to address numbers. What should appear as a row of continuous buildings instead results in photographs being jumbled together onto one site. I am working with the folks who created the app to fix this bug. If people cannot be at the nodes during the scheduled times, I will mark the ground where you can stand and see a Historypin image on your smartphone or tablet. Simply download the program and you're good to go. I can also be reached on my cell phone, 952-210-1086, if readers wish to meet up in the middle of a tour. I hope to show off a great way to connect people to our history, and in turn I look forward to learning more about my own community. Come and join the fun at FLOW! Northside Troubadour Dan Hylton Performs at FLOW, Set to Release New Album! I've had the pleasure of seeing fellow northsider Dan Hylton perform at quite a few events, from the Camden Farmers Market to last year's FLOW, and he even provided ambient background music at the Hawthorne Neighborhood Council's annual dinner last year. Dan's a great guy, a fellow housing geek, and a darned good musician to boot. So I jumped at the chance to review his upcoming album, "The Secret of Him," before its August 4 release concert at The Warren. I had the CD on loop while working on my own FLOW presentation, and it made for great accompanying music. This by itself is high praise, as I usually write and do other projects in silence. But since I was focused on other things while giving the album a spin, my first impression wasn't about any particular song but instead about the album's tone. "Music to listen to while curled up under a blanket on a rainy day" was what kept coming up in the back of my mind. I thought specifically of two of my favorite such albums, Jonathan Rundman's "Wherever" and Nick Drake's "Pink Moon." Interestingly enough, both of those albums employ a green/white/gray color scheme. Rundman, by the way, is a former northsider himself and has done concerts at Papa's Pizza with the Camden School of Music. The Department of Regulatory Services in Minneapolis is proposing changes to rental licensing and associated penalties. Currently, the most severe penalty to a landlord happens only after two rental licenses are revoked within five years, at which point he or she loses all rental licenses within Minneapolis for a five-year period. In theory, the way this works is that a landlord loses one license, and then is on a short leash for all the other properties. In practice, slumlords like Mahmood Khan (who owns the property photographed above) lose rental licenses and have those losses overturned in court before the second revocation can kick in. (Search 2906 Emerson Ave N on the city's website for an example of that) Or in the Folger case, a landlord suddenly loses all of his licenses, and the tenants are the ones who suffer. 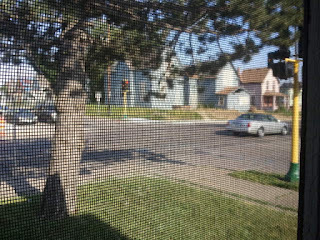 Post and photo (of DFL office on West Broadway) by the Hawthorne Hawkman. ADDENDUM: A fairly satisfactory resolution was explained by Corey Day of the DFL party, and is summarized in the comments section below. The Minnesota DFL Party at all levels shall not provide support and funds to candidates unless they are duly endorsed, or are seeking an office without party designation and are not running against a duly endorsed candidate. Shoddy Work Continues at the "Lead Paint House"
Post, bottom image, and second photo by the Hawthorne Hawkman, top photo from the @daviss Twitter feed. 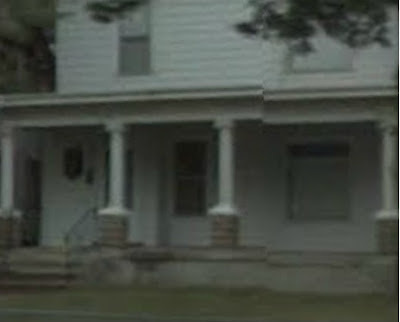 The "Lead Paint House" at 1406 Girard Avenue North was widely discussed on North Talk and the Johnny Northside blog. The conversation spilled over into one of the break times at Old Highland's Window Restoration Boot Camp. Participants were baffled by why NHS or their contractor would do such a thing. None of the experts there believed such notification was necessary to comply with federal guidelines. 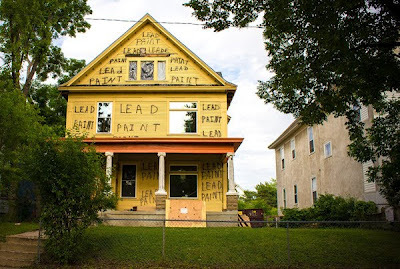 But at least that spray paint can be fairly easily undone--if you were going to restore the original siding in a lead-safe manner, it'd come off anyway. Another neighbor pointed out something worse. She saw them taking out a window that didn't open or close (and therefore was not a friction surface in need of lead paint remediation in the same way as other windows) and replace it with a non-historic and wholly inappropriate disposable window that doesn't even fit the opening. I would have blogged about this maneuver a while ago, but needed to verify it for myself. And the photo that started it all has that area blocked off by a tree. So I made my way over to the house recently to record the visual offense. Now I don't know who made the call to rip out the window and replace it, Northside Housing Services or Gary Kittleson, the contractor. But the contractors didn't even put a similarly-shaped window back. Instead, we have plywood around the edges, just like some of the worst slumlords on the northside have employed. This, if my eyes and historical research are correct, is an ocular window. It's one of those little details, like the proper siding on a house, or a variety of built form designs, that you might not really notice when you're going through a neighborhood. But your brain does. It picks up on these cues and tells you, whether you realize it or not, if you like house and the neighborhood. A good developer and a good contractor know these things, and plan their work accordingly. NHS and Kittleson failed to do so here, on multiple levels. And yes, I know NHS has done a lot of good for the northside. They administer the Jordan Advantage down payment assistance, which I used to help qualify for my new home. And my experience with that was quite good. 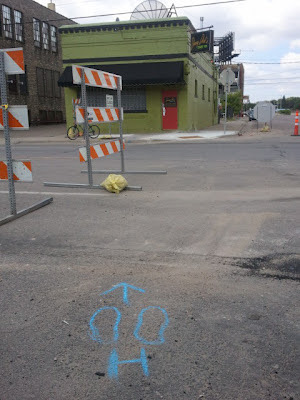 But there's no good excuse for this kind of substandard work, especially when it's subsidized by taxpayer and foundation dollars that are supposed to be used to improve our community. Maybe it's time for NHS to let someone else handle home rehab work, if this is the result we get. Post and video by the Hawthorne Hawkman, audio from a Koenig bankruptcy proceeding. A whole series of Koenig bankruptcy documents have come my way, and they are quite revealing. Based on what I can piece together here, it looks as if the United States Federal Credit Union essentially forced Koenig into bankruptcy by demanding he either pay them the $1.1 million owed or demonstrate that he does not have funds for a payment plan. The bankruptcy appears to be involuntary, and was in fact discharged. Only after that did other financial dealings come to light. Yet Koenig was less than forthcoming with the trustee regarding his finances. After the discharge, the case was brought back to life. The audio file posted here was from a hearing where the judge ordered Koenig's attorneys to cooperate with the trustee. He brings the hammer down quite convincingly, I might add. Bankruptcy Proceedings About to Land Notorious Slumlord Paul Koenig in Financial Hot Water! Post and illustrative stock photo by the Hawthorne Hawkman. An anonymous commenter recently made readers of this blog aware of the fact that Paul Koenig, the slumlord behind Dream Homes, Pamiko, and a host of other slummy LLC's, as well as a failed attempt to keep his foreclosed properties for $1 apiece, can't even go through BANKRUPTCY without getting into more financial difficulty. The man at one time owned eighty or more properties in north Minneapolis alone, and used this community as a cash cow to feed an extravagant lifestyle of motor homes, racehorses, and a mansion in Afton. Oh how the mighty have fallen. Documents are coming into my hands from a source associated with the Johnny Northside blog. Two such docs are already here; one is a Notice of Removal transferring Koenig's bankruptcy proceedings to a different court, and the second is an Unlawful Detainer Koenig filed at his (now rental) property at 1775 Majestic Pines Trail, Afton MN. I'm not an attorney nor have I ever declared bankruptcy, so what follows is a layman's reading of these documents. However the very first time I noticed something odd about the Pamiko property empire, I posted what it was that I did know in hopes that more information would follow. I'm employing the same strategy here, and eagerly await more documentation. Post by the Hawthorne Hawkman, image from Marcus Harcus' campaign website. 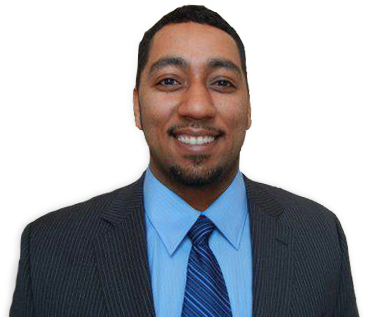 [Marcus Harcus'] name will remain on the ballot, but I have suspended my campaign for State Representative due to a lack of support, financial and management-wise. Yes, there were a few dozen people who committed to volunteering, but I can't manage the campaign and be the candidate at once, at least not without enough money to get the messages out to my community. Many people tell me to keep running... next time, but I'm done. My window of opportunity is closing in 2012. This was a bad year to run due to my personal finance, health and related challenges, but it was now or never for me. I have been waiting to see if Mr. Harcus would post something more formal on either his campaign website or campaign Facebook page, but no new information has appeared there as of the time of this posting. Given the importance of knowing who is and is not campaigning for office in north Minneapolis, I elected to wait a reasonable amount of time and then share the announcement. Although I have supported Joe Mullery in this race, I was surprised and impressed with how well Harcus had run his campaign. His last push for elected office was not a serious attempt, and even he admitted so. However, it's pretty rare for someone to make a transition from a political also-ran to a legitimate contender. I believe Harcus did exactly that. While he has stated that--win or lose--this would be the last time he runs for public office, I hope that he changes his mind in the future. Harcus' departure almost certainly clears the way for Mullery to be re-elected. A suspended campaign isn't the same as completely bowing out, but I don't see how Marcus can get more votes if he's not actively campaigning against a long-term incumbent. Another possibility is that one of the other handful of challengers could revive their campaign. But since the filing deadline has passed, they would have to run while asking people to write in their name on the ballot. Given that all other candidates were eliminated from the DFL endorsement on the first ballot at the convention, I doubt they have the support needed to succeed in such an endeavor. The least likely but scariest prospect is that the Republican challenger Cindy Lilly could beat out Joe Mullery. However unlikely that is, he's still got a campaign to run. Joe Mullery - "Why I Voted Against the Stadium"
Post and photo from Rep. Joe Mullery's email newsletter. This week Joe Mullery sent out a very detailed explanation about his vote on the Vikings' Stadium bill, and his vote against it. The letter affirmed my support for him and served as a reminder that I need Mullery lawn signs for my new house. Mullery's words appear after the jump and are unedited. Who Would Want to Live at 26th and Penn? This was the question most frequently posed to me over the course of a few months when I would tell friends, neighbors, or colleagues that I wanted to buy the house at 2601 Penn, with "Are you crazy?!" and "Do you want to get shot?" as first and second runners-up. The answer to those questions (yes, a little bit and no, not even a little bit for the 2nd and 3rd ones) is partially that the preservationist in me wanted to be able to say that my house was one that would have been demolished if I hadn't come along. The house had to be appealing on its own terms, but preservation was an important aspect of my homebuying process. 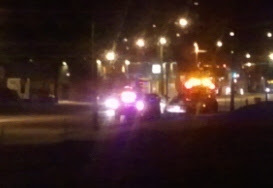 Post and photo (of the first MPD traffic stop in front of my house since I bought it) by the Hawthorne Hawkman. For months, I've been itching to tell this story about a fake police raid at my house. I couldn't do so until after it actually became my house. Since this is one of my favorite vignettes during the homebuying process, it gets top billing for the post-closing blog entries. Post by the Hawthorne Hawkman, photo from Mama Askofu. 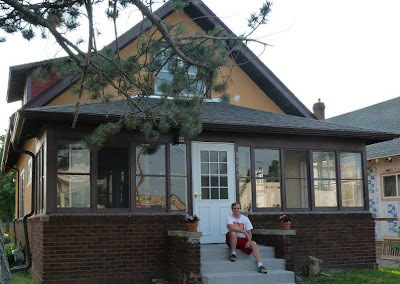 On Friday June 29th, I became the newest north Minneapolis homeowner when I closed on my house at 26th and Penn. For a long time, I'd been eying up this house, much like a shy kid in the corner of a high school gym, mustering up the courage to ask someone to dance. But I was rebuilding my credit and there were many such homes I longed after and couldn't buy. Almost two years ago, however, the comment thread of a blog post at The Irving Inquisition vaulted 2601 Penn to the top of my list of homes I fantasized about owning. Part of the desire to have this specific house probably comes from my Quixotic nature. I'm most intrigued about opportunities especially after someone tells me they are impossible. Two years ago, saving this house from demolition certainly seemed so. Because of my preservationist bend, I also wanted to find a house that, were it not for my acquisition, would have likely ended up in a landfill. Anybody can go out, look at a perfectly refurbished home (or one that never needed refurbishment in the first place), fall in love with it, and buy it. Not everyone can look at a dilapidated structure in a state of disrepair, envision what it would look like if restored, and take the steps needed to bring the house back to a livable condition. Since I can see what house would look like when restored, I felt something approaching an obligation to pick out just such a structure when finding my own home. With the work I've been a part of in turning around crime in the EcoVillage, I also felt less intimidated than others might be about living in an area that still needs crime reduction work to happen. Furthermore, I thought if I could help turn around a house that many thought was past the point of no return, and that was in an area beset by other problems, then I could show others that it's possible and even desirable to take on such challenges in our community. I met with a GMHC representative and my Realtor, Constance Nompelis, to look at this house back in the fall of 2011. The house was boarded, vacant, dusty, cold, in need of significant work, and smelled like several animals had crawled in here to die (which was unfortunately the case). I walked in, looked at the south-facing picture window, imagined how the sunlight would stream into the home and fall upon the built-in woodwork, and essentially said, "This is PERFECT. I'll take it. Don't even replace the windows." The rehab and closing process took over six months to complete, and brings with it a series of blog-worthy stories I have been unable to publish until now. Those will come over the next few days and weeks, as well as new home ownership adventures that are sure to present themselves. My first day in my new home was marked with a small and heartwarming surprise party put on by friends and neighbors. Others were stopping at the intersection, waving, and shouting their congratulations. Strangers at the bus stop kept telling me how they've been watching the rehab work with great anticipation, and how they love what's been done. Even my mother happened to be passing through town and had the chance to welcome me into my new home. The day couldn't have been better. Thank you to everyone who helped make this dream happen.